The Virginia governor held a press conference today and it was a bizarre, rambling defense that ‘blackface’ was commonplace in the 1980s. Who is this guy trying to fool? I cannot think of a time since I’ve been alive that blackface has been acceptable. I can remember 1984, so I’m not sure what he’s getting on about. ClashDaily covered the outrage over the blackface and KKK photo on the Governor’s Medical School yearbook page here. Gov. Northam admits that he took responsibility for the photo yesterday, but that he had never seen the photo before. He is confident that he is not either of the people in the photo. In consultation with his family and his former schoolmates, he’s pretty sure it isn’t him. He believes that if he had dressed up in blackface or as a Klansman, he’d probably remember that. Gov. Northam then says that he did put some shoe polish on his cheeks once when he entered a Michael Jackson dance competition in San Antonio in 1984. He only used a little bit because it’s really hard to get shoe polish off your face. He won the Michael Jackson dance competition because he learned how to moonwalk. He says that the man he was is not the man he is now. Gov. Northam refuses to resign. He is really sorry for the hurt that this episode has caused. He is ready for a real conversation about racial justice and reconciliation. He says that there were ‘many mistakes’ in the East Virginia Medical School yearbook in 1984. Governor Northam believes that his reputation will be cleared in the coming days. The Governor says that he has ‘a lot of African American friends’. Here, Northam talks about the Michael Jackson blackface, and how he spoke to his friend Seth as he was campaigning for the 2017 election. "I dressed up… Michael Jackson … I had the shoes, I had a glove, and I used just a little bit of shoe polish to put on my cheeks… It was a dance contest. I had always liked Michael Jackson. I actually won the contest because I had learned how to do the moonwalk." So, let me get this straight… Is Governor Northam saying that he didn’t realize that blackface was offensive until 2017? Seriously, man! This dude has some issues with his judgment. Who has to tell you to not do a moonwalk right after admitting to wearing Michael Jackson blackface? But then, that’s nothing new with Democrats. This is the party that embraced Senator Robert Byrd. His recruitment days for the KKK were dismissed by President Bill Clinton as just being a ‘Good ol’ Boy’ in the South. 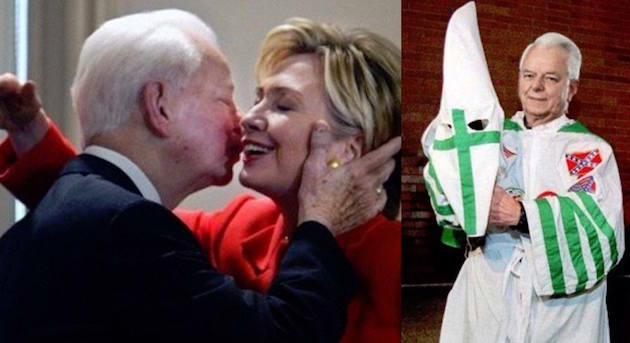 Senator Byrd was Hillary’s mentor. Obama spoke at Byrd’s funeral. The left is no stranger to racism that doesn’t get called out. Back to Gov. Northam’s exploding scandal. What about the nickname ‘Coonman’ in his 1981 yearbook? During the Q&A with reporters, Northam was asked about it. He says that he recalls two upperclassmen that called him that and he ‘doesn’t know their motivations’ for giving him the nickname. The photo on Northam’s page wasn’t the only instance of blackface in the yearbook. What the hell kinda school did this guy go to?!? This presser left us with more questions than answers. How did he never see this yearbook photo until Friday? When he first saw the photo, he told the person showing it to him, ‘That’s not me,’ why then, did he take responsibility for ‘having himself portrayed in that manner’? Why didn’t he just admit right away that it wasn’t him in the photograph? Is the scandal worse now that he admits that he ‘vividly’ recalls putting on blackface for a Michael Jackson dance competition? How did he know that shoe polish is hard to remove from one’s face before dressing up as Michael Jackson? Who did he hang around with in the 1980s to make him believe that blackface and dressing up as members of the KKK was ‘commonplace’? How the hell do you not know that blackface is wrong until a conversation with a black person in 2017?! Why the hell didn’t he just resign? Can he still do the moonwalk? There were lots of people who reacted to Northam’s suggestion that blackface and KKK hoods were ‘commonplace’ in Virginia in the 1980s. He’s a liar. Being from VA and stationed in Norfolk in the 80’s, this was not “commonplace “. It was only “commonplace “ if you were involved in those types of behavior! Commonplace in 1884, not 1984. Ok I was alive in 1984. Pretty sure everyone knew the KKK was abhorrent Ralph. Yeah pretty sure being in or dressing like the KKK wasn’t ‘common place’ anywhere in 1984. Not saying it wasn’t present— def wasn’t common. He needs to sit down. That’s not true, unless he grew up in the Klan. I’m a lifelong southerner, born in 1960. People were not walking around in blackface and KKK robes in 1984. Grew up in Virginia, went to college there, spent 30 years in various parts of the state and I never once saw blackface or a kkk hood whether real or otherwise. I grew up in Virginia. Life long resident. Never. Ever. Did I see a KKK hood or black face. It angers me that he’s acting as if it was commonplace in Virginia in the 80’s to do this. Come on, you remember when a few dudes could just grab some beers and chill…unwind after a hard day at school…put on a couple Klan robes and rock out. Totally normal stuff, man. Really, whose high school didn’t have a Wear Your Klan Hood to School Day? So basically he’s throwing the Commonwealth of Virginia under the bus. So #RalphNortham is trying to poison his entire community now. So his entire high school and all his friends and their families are racists who regularly wore hoods and blackface. Dude is a bigger snake than ever. Well, good luck with that political career, Ralph.